You may not know her name but you will. She is an indie darling perched delicately at the cross roads of pop, folk, and even a side street of electronic. She is comparable to Tori Amos but comes across as more accessible, more relatable and because of that more enjoyable. She has been named one of KGRL's Top Ten Artists to Watch Out For in 2008. That is a much deserved honor because A Broke Machine is a masterpiece. It is her best work yet and track after track it's brilliant. 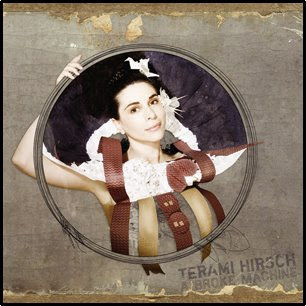 Terami expertly crafted a deep and rich collection of songs showcasing her voice and even her producing talents. I simply was not prepared to pop in this CD and enjoy it this much. It demands to be listened to. Quite frankly, I didn't want to do anything else but listen to it. Normally, when I listen to music I am doing something else whether writing a story or researching something but as I listened to A Broke Machine my hands kept stopping. I just wanted to listen. Vocally, I don't think I have heard her sound better. Her voice is strong and slightly smoky at times and it sort of lulls you into this peaceful state of bliss. Instrumentally, Terami is at the top of her game. The keyboards compliment her voice perfectly and carry through the record like a gentle breeze. This is an album perfect for any occasion. It's quiet enough to play in the background and strong enough to blast the doors off your house. I had planned to go through each track and give my thoughts but I think it's best to let the songs speak for themselves. Music is subjective of course so my thoughts on each song probably wouldn't make a lick of sense to the next person. I'm not finding anything to complain about on this album. I can only sing its praises. There is not a bad song in the bunch. Musically and lyrically it's a beautiful, rich, and magical album. Just do yourself a favor and buy the album when it comes out on April 15. You won't regret it. A Broke Machine is a perfect album from a fresh and intriguing musical talent. A work of art if there ever was one. You can buy her other albums at CDBaby.